In 2013, Apple, released fingerprint authentication with it’s new iPhone 5S, but it was only for unlocking the device. Toward the end of 2014, Apple opened up the third party usage, and user expectation grew for all mobile apps, especially for an experience like Fidelity, where authentication is required to do anything investing related. Passwords and usernames are a pain for everyone. In the investments space, we straddle a fine line: We want security to be high, but we also want to be able to act fast. With Touch ID available for implementation into the app, the user pain of manual authentication became more and more apparent. In early 2015, a report was released which documented that 24% of comments on the Fidelity iOS app revolved around our lack of Touch ID authentication. I led the design work for Touch ID implementation. This project was light on the visual design, but heavy on logic and user flows. The goal was first to build awareness that touch ID is available for the Fidelity iOS app, and second, create a smooth login experience with a touch ID feature that was still fairly new to all iPhone users. Competitive Analysis: Admittedly, we were not the first ones out the door with a Touch ID enabled app, but this did allow us to learn from others’ mistakes. The recommended view from Apple had two calls to action in addition to tapping your finger on the home button: “Enter Password” and “Cancel”. We saw a trend among experiences where the “Enter Password” button was being removed – and rightfully so! iOS users have been trained to look at alert views and take the positive action. If that is “Enter password” they will do that and totally miss the fingerprint authentication. Giving an alert view, where the only call to action is “Cancel” it becomes a little more clear that there is something to do outside of the alert view. 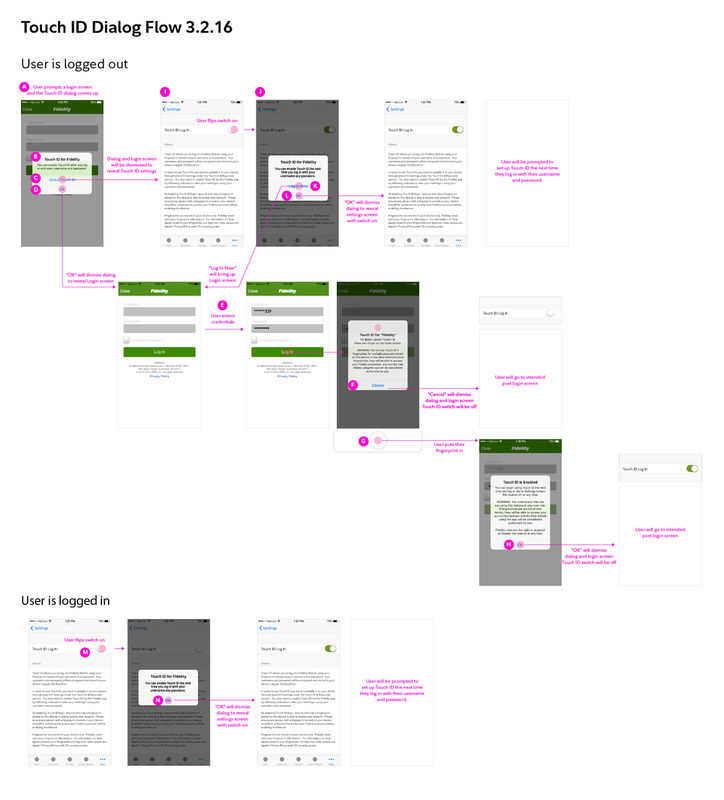 Screenshots taken from the Amazon, American Express, Google Drive, and Mint experiences. User Testing: Without access/time for an official usability test to confirm our hypotheses, we resorted to guerilla testing, and relied on fellow coworkers who use Touch ID on a regular Basis, and those that have it but do not use it. This involved sending out an email to the larger team asking people to volunteer some time to show us how and where they use Touch ID most, and what they think of existing experiences. User Flow Diagram: With an advertised release, users were going to be wondering about where and how to set up Touch ID, so this was going to be a little more complicated than serving it up after login. To ensure awareness, we prompted an alert upon tap of any target that would bring up the login screen. The alert informed the user that Touch ID is available and that they could set up after logging in. Within a month of the release, the app store rating was up to 4.0 from 2.8. Later in the year, a stat was released showing that logins had also increased 15%. Next steps involved taking learnings from iOS and enabling fingerprint authentication on the Android platform.